Reformed by Peter the Great in the early 1700s, Russia’s army had emerged by the century’s end as one of the strongest in the world. And while overhauling the organization and logistics of his forces, the tsar also demanded uniform appearance - haircuts included! 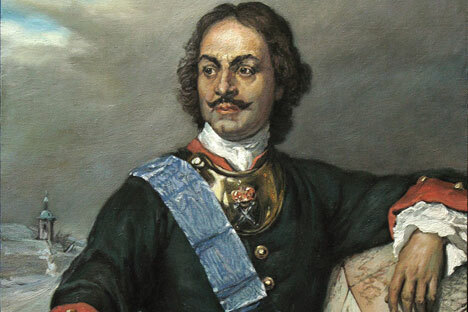 At the turn of the 18th century, a series of victories won by Peter the Great decisively shifted the balance of military power away from Sweden in favor of Russia, Europe’s new rising power. Yet the Russian army of the erawas ill-equipped and poorly outfitted – which made it a key focus of the program of radical reforms implemented by the tsar with the aim of reorienting Russia toward the West. Peter set about clothing his army on the basis of an existing model: Two of his personal infantry regiments, the Preobrazhensky and Semyonov regiments, were originally formed to implement the tsar’s war games. However, over time they became full-fledged military units with comprehensive weaponry and uniforms. The first wore green caftan-style greatcoats and felt hat, red tunics and knee-length pants, white stockings and crude shoes that were switched for long boots as needed. The Semyonov regiment wore different colors, from the felt hat down through the light blue tunic. But by 1720, standard dark green kitwas issued to both, with only red or blue collars and cuffs denoting the regiment. The tsar adopted a similar design to other army uniforms in Europe, reflecting his policies of Westernization. But a main obstacle to achieving genuine uniformity of appearance was Russia’s limited capacity to produce enough identical sets. Such inconsistencies hampered efforts to modernize throughout Peter’s reign. Due to the shortages, many soldiers still wore arbitrary colors, and even entire regiments continued to wear gray woolen uniforms produced by cottage industries. At the time, Peter’s hastily dressed and armed troops were locked in conflict with Sweden, one of the strongest military powers in Europe. Although the era is best remembered for the landmark victories won over the Swedes, in some cases the defeats also proved significant for Peter’s military reforms. In 1700, the Swedish king routed the Russian army at Narva, on today’s Russian-Estonian frontier. Only the Preobrazhensky and Semyonov regiments proved resilient, repulsing all Swedish attacks but at a high cost in casualties. Officers also received striking crescent-shaped breast badges inscribed with ‘1700’ and made of silver or gold plating, depending on their rank. Each Russian army regiment had a grenadier company composed of the burliest soldiers. Initially their task was to throw grenades, but over time the grenadiers took the same function as the rest of their regiment, while preserving unique features of dress. The most distinctive element was a dome-shaped cap with no rim or peak so as not to impede the throwing of grenades. Its front alsobore a metal plate stamped with the imperial eagle. But the desired level of uniformity went beyond clothing and equipment: Peter also ordered compulsory moustaches and that soldiers’ hair becut above the shoulders. The chief insignia of officers was a sturdy woven sashtrimmed with gold and silver threads, which ran over the shoulder and attached to the belt. In 1799, during the Battle of Devil's Bridge in the mountains of Switzerland, several of these sashes were even used to lash together a log bridge. The green uniform introduced by Peter was retained for more than a century, while the imperial cavalry and artillery units always wore blue and red uniforms, respectively. The greatcoat was also gradually modified until the mid-19th century, by when its lines had become similar to the modern dress coat, with tails instead of a long hem. The waistcoat was shortened, and the cocked hat was gradually transformed into a bicorn design. A special uniform was also introduced for generals, who had previously worn the standard officer’s outfit with added insignia. Over time their clothing became more elaborate, with added gold or silver trimming on the collars and cuffs. After Catherine II (the Great) assumed the throne in 1762, Russian military dress was further reformed to the specifications of Prince Grigory Potemkin, renowned as a court favorite of the Empress and her lover. Soldiers were issued with a shorter, more comfortable tunic, broad linen trousers and a top cloak made of thick cloth. After centuries of evolution, the Russian warrior finally achieved uniformity in appearance, with one extra seal of approval: The Potemkin design was highly popular with the troops due to its ease of wear.